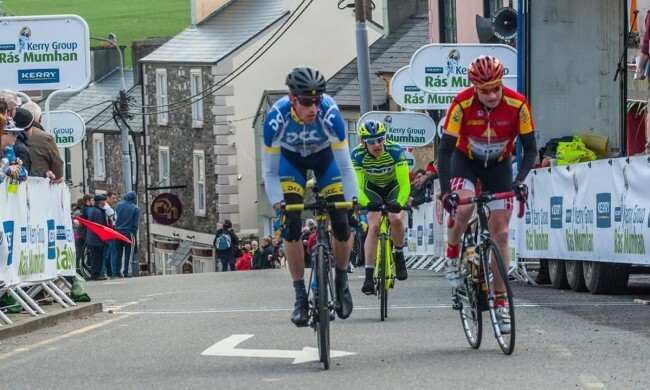 Easter weekend saw the Waterford riders tackle what is undoubtedly the second toughest stage race after the RAS itself. Ras Mumhan takes place in Kerry/ Cork over four days with the shortest stage 98kms and the longest 150kms. Waterford Comeragh travelled with six riders; Ciaran Power, Martin Cullinane, David Halligan, Noel O’ Dwyer, Finbarr Power and Tadhg de Barra. The team was supported by Sinead and Cian Power. The race consists of most of the top A1 riders/ teams in the country as well as several international teams from Continental Europe and the UK. Stage 1 was on Friday afternoon, a 98kms loop from Killorglin to Killarney over some rough roads. Team Sponsor Hutchinson Auctioneers would have appreciated the large houses which dot the famous Irish road between Killarney and Killorglin. Stage 1 is always a tremendously nervous stage. Before even reaching Killarney, there had been four crashes in the bunch with Finbarr being badly delayed by one. The performance of the day belonged to Dave Halligan who placed well to finish in an advanced group with Martin, Tadhg, Ciaran, Noel all coming in together with a chasing group. The second stage of Ras Mumhan was an epic which will be talked about for years to come in Irish cycling. Race distance was 150kms. Showers and a strong winds were forecast, however the start to the day was dry. Almost all riders were deceived by the temperate conditions at the start and dressed too lightly. Ciaran was unfortunately caught out by snapped rear derailleur cable which saw him stuck in an 11 gear. We all know of Key’s power, but not even he was getting up the Healy Pass in an 11. The snapped cable saw his race end. The first climb of the day was to Lauragh and both Dave and Tadhg fought well in narrow roads to hold position at the front of the bunch. A break did go early containing Bryan McCrystal but was pegged back on the Healy Pass. Both Dave and Tadhg survived Lauragh to descend in the front group. On the Healy Pass, Tadhg allowed some poor positioning at the bottom of the climb catch him out and he drifted to the tail end of the front group which was one long line out over the pass. Dave made a better ascent and was comfortably in connection with the main group. Some good descending skills from his XC MTB days saw Tadhg set himself back into the front group. Dave unfortunately was caught out be one of the hairpin bends and had a ‘moment.’ He did well to stay upright be the interrruption saw him loose contact with the first group. He was joined by Noel in a new group. Martin too had a small crash with a car in the calvacade as he descended. One cant underestimate the speed and aggression in this descent. Most of us touched speed of 90kms per hour. After Healy came the ascent of Derreecarrin, a 7km drag which lined out the bunch. Next came the Pass of Keimaneigh. An attack by Aquablue lined out the bunch which in turn splintered. Tadhg ascended the climb with a Killarney rider before being joined by a group from behind. At this stage, the weather had become horrendous with driving rain, hail showers and strong winds. The last 60kms back into Kenmare was an epic and we all had our stories of survival. Many riders abandoned prior to the finish, many others needed paramedic attention and several riders were brought to hospital with hypothermia. The cold weather played havoc with some rider’s sports induced asthma. Team Sponsor EirgenPharma in Waterford is developing a new soluble steroid tablet which will benefit such asthmatics. The next stage contained fewer meters of ascent but did go over the highest pass in Ireland, that of Coomanaspic. After yestderdays experience, we were all wrapped up warm and well fed on Team Sponsor Chia Bia’s Mix. It was a stage which began in Force 6 southerly winds from the south. Along the exposed road, riders were already near threshold holding wheels in the neutralised start. When the flag dropped, the bunch immediately split into echelons. Eventually after a couple of climbs, a large group formed which in turn rode tempo for the next one hundred kms. Tadhg had another go in the ascent of Coomanaspic with a Dutch rider and after ten of so kilometers away, they were caught again. He finished with Martin, Noel and a group of a round twenty riders. The fourth and final stage is circuit based around Killorglin, known for its high speed. Both Martin and Tadhg were active trying to get in the breaks but after fifteen kms a break had escaped and the yellow jersey’s team had settled down to chase so there was no further attacking. The finishing circuit was ten laps of a short circuit. Finbarr did the ride of the day staying in the main bunch for most of the day. Martin and Tadhg were both caught out by a parked car which cost them both some placings in the overall GC. Overall, it was a great race for Waterford Comeragh Everybody had to up their game in circumstances which didn’t suit them such as climbs, descents, crosswinds, line outs and over distance. At these same points, riders had opportunity to work to their strenghs and use the hard winter’s training we all put in. Support from Sinead and Cian Power was tremendous and great asset to the riders because as soon as the cycling stops, the race to recover, to eat and to rest begins, all in preparation for the next day’s stage. After spending a long morning in a stressful calvalcade trying to get food, fluids and spares to their riders who were strung out across the race course, their working day only started; there were massive meals to be prepared. The Comeragh team simply would not function without them, and the fact that most of us got relatively stronger as the course progressed owed as much to Sinead and Cian’s support and ability to enhance our recovery as to our fitness. Out of 180 starters, only 114 finished which says a great deal about difficulty of 2016 Ras Mumhan.